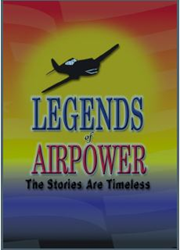 Legends of Airpower, the 4 season series narrated by award winning broadcast journalist, Gene Pell, is now available for viewing on Amazon Prime. This series, produced by 3 Roads Communications of Frederick, MD, recounts the timeless stories of fifty-two men and women who made America's air power the most respected in the world. From Chuck Yeagar, to Buzz Aldrin, to Jackie Cochran, to Amelia Earhart; each Legend is profiled in a separate, 30 minute biographical program that traces their personal and professional lives. Legends of Airpower has been written into the Air Force JROTC curriculum. "Legends" has been broadcast on more than 20,000 public TV stations across America, in addition to Speedvision, and Discovery Military Channel. The series is now accessible on Amazon Prime so you too can help make the legends soar on.